The most astounding thing is that he is still a student with a monthly income of around $500. 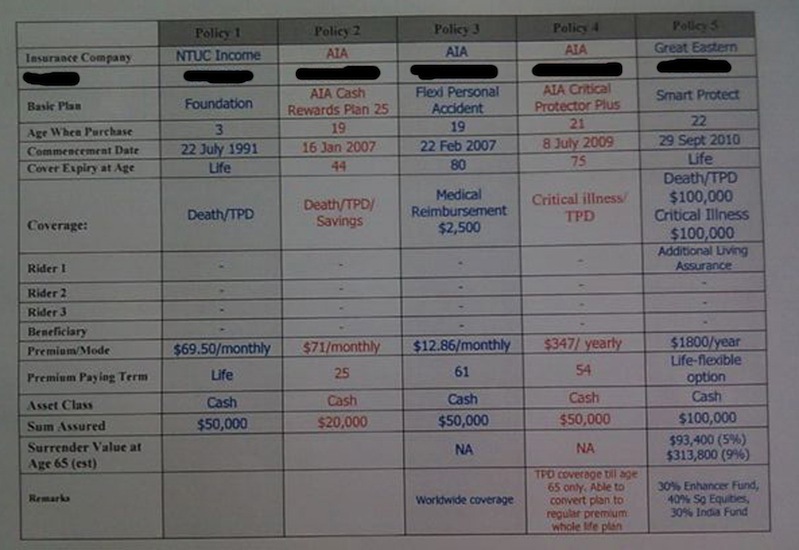 He was already paying almost 40% of his income on various policies until last year where he was sold an investment-linked policy (ILP) of $150 a month, making a whopping two-third of his income spent on insurance. The worst part is that he is far from being adequately insured. This problem may well follow him after graduation as most young people have a high need for liquidity. After committing a significant amount to insurance, he may not be able to properly insure himself within a reasonable budget. I think the industry really needs reform when young students who have not even joined the workforce are shortchanged by “financial consultants”. Actually, this is nothing new. Many insurance agencies, especially those with pretty female agents, are specifically targetting National Servicemen to sell financial products. Some go after the money of fresh graduates, locking them into unnecessary and long-term financial obligations from a young age. It is good to start young, but the reality is that most people buy all kinds of rubbish. Some, after being duped into a bad purchase, become averse to all things financial. Post is written with the permission of the person. Is That Really A Free iPad?